The Conference will be hosted by the Rt. Hon. Baroness Verma, Under Secretary of State for Energy and Climate Change, to discussthe role of women in the rise of Africa, with special focus on the need for the Diaspora African Woman to constructively engage with the current exciting and transformative moment in Africa’s history. The Conference aims to provide delegates an opportunity to gain insight and join discussions about the obligations, obstacles and opportunities for the Diaspora African Woman in Africa Rising. It is hoped that this Conference can provide an avenue for understanding and paving a way for African women, including those in the Diaspora, to play an integral part in the rise of the continent in the wake of Africa’s changing political, environmental; economic and social landscape; and the United Nations Post-2015 Sustainable Development Agenda. The Conference will be followed by the Private Screening of Yvonne's Film: "A MOTHERLAND TOUR: A Journey of African Women with Yvonne Chaka Chaka" at the Courthouse Hotel London Theatre, 91-21 Great Malborouhgh Street, London W1F 7HL. “It is hoped that this Conference can provide an avenue for understanding and paving a way for African women, including those in the Diaspora, to play an integral part in the rise of the continent in the wake of Africa’s changing political, environmental; economic and social landscape; as well as in the United Nations Post-2015 Sustainable Development Agenda” says Justina Mutale. The Conference will be moderated by International Broadcaster, Vuyiswa Ngqobongwana who presents the Africa Today Programme on PRESS TV. 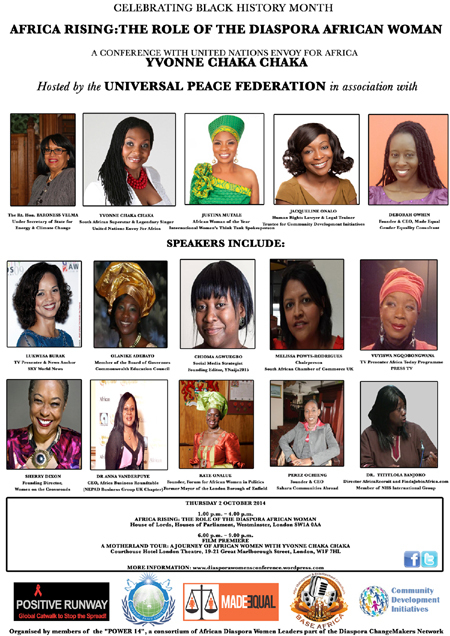 Other Speakers include Lukwesa Burak, TV Presenter and News Anchor, SKY World News;Melissa Powys-Rodrigues, Chairperson, South African Chamber of Commerce UK; Anna Vanderpuye, CEO of African Business Roundtable; Chief Kate Anolue, former Mayor of the London Borough of Enfield and Founder of the Forum for African Women in Politics; Sherry Ann Dixon, Founder & CEO of Women on the Crossroads; Chioma Agwuegbo, Social Media Strategist and Founding Editor at Naija2015; Perez Ochieng, Founder & CEO of Sahara Communities Abroad (SACOMA); and Dr Titilola Banjoko, Healthcare Manager and Director, AfricaRecruit and FindaJobinAfrica.com. The Conference will be followed by the Private Screening of Yvonne’s Film, which is based on women’s health and empowerment. The film tells the inspirational story of African women who are making a positive impact on the health of their communities. In the film, Yvonne travels through Africa meeting courageous women who are changing lives. As each story unfolds, so does a powerful message: “Health is not a luxury of the few, but an inalienable right for all”. By following Yvonne on this journey, audiences will hear the voices of the marginalised women and communities empowered by hope, which may not only lift viewers’ spirits but also raise voices against the disparities that still exist around the world. This film is a call to action for nations to honour their commitments to improve the health of all Africans, especially women and children in meeting the Health Millennium Development Goals. The Conference is organised by members of the “POWER 14” in association with the Universal Peace Federation. The “POWER 14″ is a consortium of African Diaspora Women Leaders selected for their phenomenal leadership qualities and achievements in community development. The “POWER 14″ are part of the top 100 Diaspora ChangeMakers Network, a project by the Royal Society of Arts with support from DfID’s Common Grounds Initiative, Comic Relief and Unbound Philanthropy, that seeks to identify and bring together the UK’s most promising individuals of African origin with a desire to support African communities in the UK and Africa. The Universal Peace Federation (UPF) is a global network of individuals and organizations dedicated to building a world of peace centered on universal spiritual and moral values. It is an NGO in Special Consultative Status with the Economic and Social Council of the United Nations. It supports and promotes the work of the United Nations and the achievement of the Millennium Development Goals, and advocates renewal of the United Nations, including a proposal that the United Nations create an inter-religious council within its structures. UPF implements its programs through a global network of Ambassadors for Peace.